Peter Ranscombe meets the man hailed as the godfather of New Zealand pinot noir, Larry McKenna. IT’S all change at Escarpment Wines in New Zealand – the company has been sold to Australian peer Torbreck, winemaker Huw Kinch is leaving to go and work at the Pyramid Valley winery and a district marketing body has been formed, controversially choosing to call itself “Wellington Wine Country” instead of “Martinborough” or “Wairarapa”. Yet – as he sits at the head of a long tasting table at Vivat Bacchus, a South African steak restaurant and wine bar in Farringdon in London – Escarpment’s unflappable founder, Larry McKenna, is sanguine about the changes. He describes the sale of his shares as “bittersweet” but he’s staying on to run the winery and the new owner has already put its hand in its pocket to make cash available to buy another vineyard. Although he’s sad to see him go because they share such similar views on winemaking, McKenna wishes Kinch well on his move. And the word “Martinborough” will definitely be staying on the label of his bottles, no matter how the local authorities decide to promote the wider area to tourists. His 2016 Escarpment Pinot Noir is warm with wood smoke, red cherry and red plum aromas on the nose, leading into more red fruit, cinnamon and vanilla on the palate, as well as a twist of blackcurrant on the finish. For anyone who still thinks that quality pinot noir begins and ends in Burgundy, this is a fine international benchmark. It was interesting to contrast the new vintage with the 2015 Escarpment Pinot Noir (£22.39, Great Grog), which for me had a sweeter nose, with more cinnamon and vanilla, a greater tingle from the acidity and a crack of warming black pepper spice on the finish. McKenna also bottles a trio of single-vineyard pinot noirs, each with subtle differences. The 2016 Escarpment Kiwa Pinot Noir (equivalent to £29.60, Cru) offers smoke, red cherry and ripe raspberry aromas, with jammier raspberry and strawberry tastes accompanied by cinnamon and vanilla on the palate, while the 2015 Escarpment Kiwa Pinot Noir (£27, R&B Wines) had a more savour note of tomato plants on the nose and fresher acidity. Over a lunch of confit duck, the freshness of the acidity in the 2014 Escarpment Kiwa Pinot Noir (£24, R&B Wines) was still on show, with red plum and ripe raspberry flavours coming to the fore. The more assertive tannins in the 2016 Escarpment Te Rehua Pinot Noir (£28.99, The New Zealand House of Wine) and the 2015 Escarpment Te Rehua Pinot Noir (£27, R&B Wines) make them better partners for food, with both delivering heavier wood smoke aromas, accompanied by leather in the younger wine and sandalwood in the older one; the 2015 also had more of a savoury edge, with flavours of clove and roast meat. 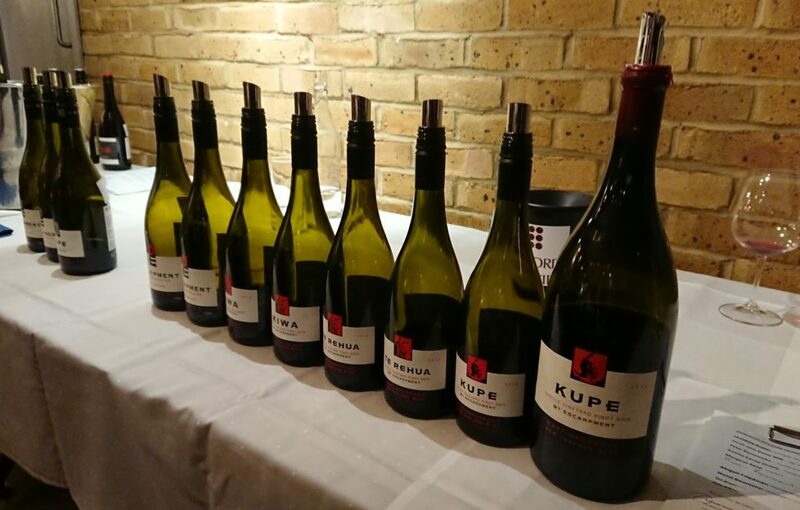 Those smoky notes were even more pronounced in the 2016 Escarpment Kupe Pinot Noir and its fellow 2015 Escarpment Kupe Pinot Noir (£32, R&B Wines), with the 2016 offering sweeter, riper, jammier flavours of raspberry, alongside milk chocolate and baked fig, while the 2015 served from a magnum was more strawberry-centred, with caramel and vanilla. Perhaps the most interesting wine at the tasting and lunch was a 2001 Escarpment Pinot Noir – made using grapes from the Kiwa vineyard – dating back to just two years after McKenna founded his winery; while the tannins were surprisingly still quite firm, the maturing flavours were delicious, with coffee, cloves and mushroom joining the cranberry and redcurrant. McKenna and Kinch also embarked on an experiment, producing the 2017 Escarpment Noir by intervening as little as possible in the winemaking process and adding no sulphur dioxide as a preservative. “This is my hipster wine,” jokes McKenna, whose bearded and tattooed son runs a bar in New Zealand. The resulting liquid – which many would classify as a “natural wine” – was made in clay amphorae and smells of the fur of a cat warming itself by the fire in winter, with notes of cloves and soda bread on the palate, along with red plum and blackcurrant. 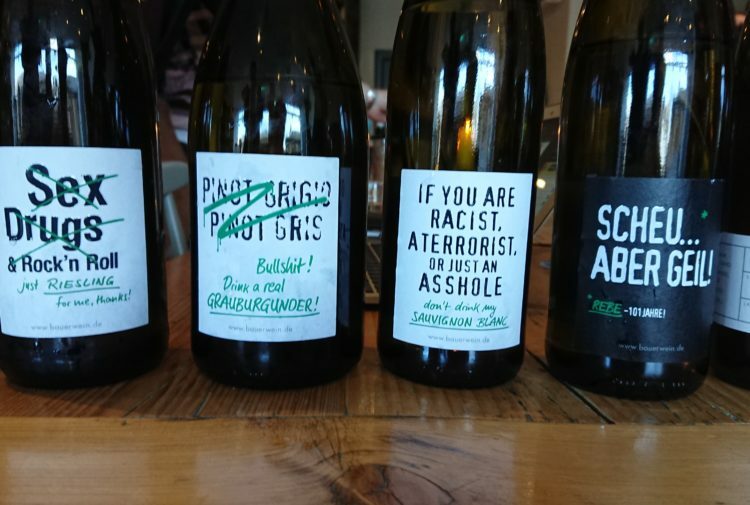 It’s designed to be drunk within 12 months of release and isn’t designed to age; sadly it’s not available in the UK, but I could see it quite contentedly sitting in Oddbins’ range of high-quality “natural wine”. 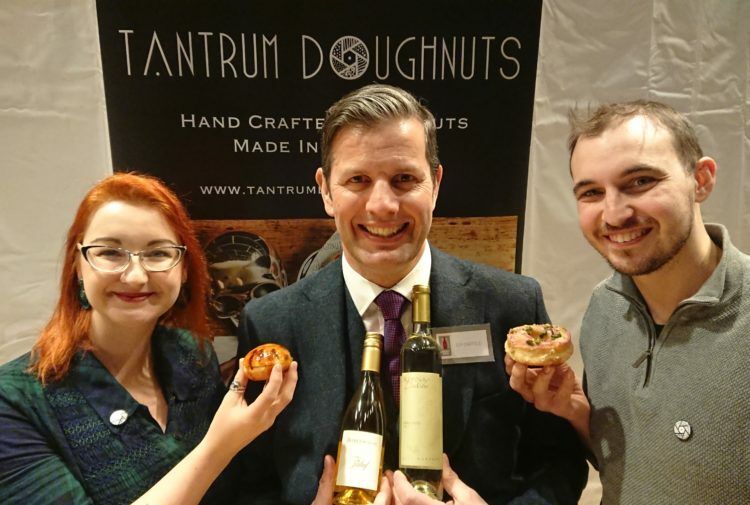 While McKenna is best-known for his reds, it was interesting to try one of his white wines too – he eschews New Zealand’s trademark sauvignon blanc and instead favours pinot blanc, pinot gris, riesling and cool climate-style chardonnay. 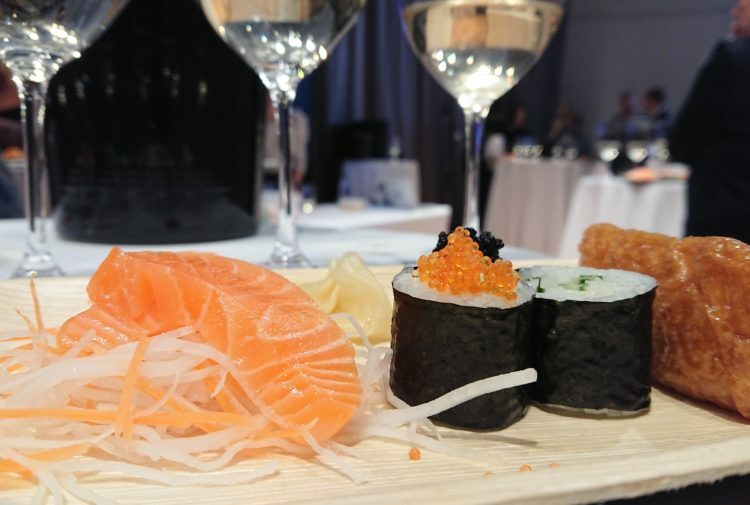 The 2015 Escarpment Chardonnay has a touch of smoke – which other tasters likened to a classic burnt match aroma – along with lemon rind, with savoury apricot and lemon rind flavours on the palate being joined by elements of butter and cream. Cool-climate chardonnays are often compared to Chablis; while the butter, cream and smoke elements from the winemaking techniques prevent me from making that direct comparison – unless we’re looking at Chablis in the style of William Fevre – there’s still a delicious freshness to the acidity that would make McKenna’s chardonnay well-worth exploring for steely Burgundy lovers. The 2014 Escarpment Chardonnay (£15.95, Frontier Fine Wines) was fresher for me, with more of a Chablis-esque focus on green apple and lemon, while the 2015 Escarpment Kupe Chardonnay (£28, R&B Wines) was perhaps the most food-friendly thanks to its lemon juice and granny smith flavours and even crisper acidity, and the 2014 Escarpment Kupe Chardonnay (equivalent to £16.24, Christopher Keiller) was much toastier on the nose and strayed into melon flavours on the palate.